Reconstruct galactic evolutions based on observations from large spatial instruments and telescops as well as high-resolution computer simulations. the dominant physics governing large-scale structure formation, accounting for the roles of dark matter and dark energy. High-resolution numerical simulations from Mpc to sub-pc scale. (a) 3 color (100-160-250 microns) Herschel image from GOODS-Herschel of the GOODS-North field (10’x15’, deepest far-IR imaging survey). (b) sub-pc scale numerical simulation of a Milky-Way like galaxy. (c) NGC 5557, a local elliptical with tidal tails signing a past merger (CFHT-MEGACAM, Duc) . (d) An XMM-LSS cluster of galaxies at a redshift of 0.43 (X-ray contours overlaid on an CFHTLS color composite image). 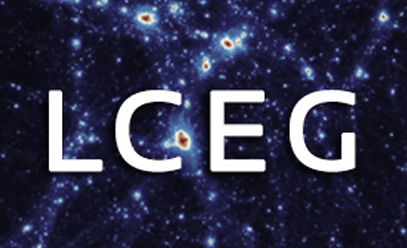 During the last five years, the members of the LCEG group have been actively involved in the observation and modelling of the formation/evolution of galaxies and galaxy clusters. Specific emphasis was put on the determination of the fundamental scaling laws describing the observational properties of star-forming galaxies and present-day galaxy clusters. For galaxy formation, extending these fundamental relations to z>2 and understanding their physical origin has now become a major source of investigation worldwide. For galaxy clusters, scaling law evolution, selection effects and precision cosmological applications represent the next challenges. These findings were made possible thanks to major observational programs with particular emphasis on the mid to far-infrared/sub-mm and X-ray domains of the electromagnetic spectrum. These important results build on the involvement of the SAp in the construction of Herschel and XMM instruments, on our participation in the Planck consortium and ground-based observations with IRAM in particular. Bridging the multi-scale physics from Mpc to sub-pc scales, our interpretation of these results have strongly beneficiated from our numerical simulations of the sub-pc-scale physics regulating star-formation at galaxy scales. These simulations have revealed the key role of dynamical instabilities driven by cosmological infall of matter onto galaxies in explaining scaling laws at galactic scales.